Imagine being able to power your car partly from the heat that its engine gives off. Or what if you could get a portion of your home's electricity from the heat that a power plant emits? Such energy-efficient scenarios may one day be possible with improvements in thermoelectric materials—which spontaneously produce electricity when one side of the material is heated. MIT physicists have now found a way to significantly boost thermoelectricity's potential, with a theoretical method that they report today in Science Advances. The material they model with this method is five times more efficient, and could potentially generate twice the amount of energy, as the best thermoelectric materials that exist today. "If everything works out to our wildest dreams, then suddenly, a lot of things that right now are too inefficient to do will become more efficient," says lead author Brian Skinner, a postdoc in MIT's Research Laboratory of Electronics. "You might see in people's cars little thermoelectric recoverers that take that waste heat your car engine is putting off, and use it to recharge the battery. Or these devices may be put around power plants so that heat that was formerly wasted by your nuclear reactor or coal power plant now gets recovered and put into the electric grid." Skinner's co-author on the paper is Liang Fu, the Sarah W. Biedenharn Career Development Associate Professor of Physics at MIT. A material's ability to produce energy from heat is based on the behavior of its electrons in the presence of a temperature difference. When one side of a thermoelectric material is heated, it can energize electrons to leap away from the hot side and accumulate on the cold side. The resulting buildup of electrons can create a measurable voltage. Materials that have so far been explored have generated very little thermoelectric power, in part because electrons are relatively difficult to thermally energize. In most materials, electrons exist in specific bands, or energy ranges. Each band is separated by a gap—a small range of energies in which electrons cannot exist. Energizing electrons enough to cross a band gap and physically migrate across a material has been extremely challenging. Skinner and Fu decided to look at the thermoelectric potential of a family of materials known as topological semimetals. In contrast to most other solid materials such as semiconductors and insulators, topological semimetals are unique in that they have zero band gaps—an energy configuration that enables electrons to easily jump to higher energy bands when heated. Scientists had assumed that topological semimetals, a relatively new type of material that is largely synthesized in the lab, would not generate much thermoelectric power. When the material is heated on one side, electrons are energized, and do accumulate on the other end. But as these negatively charged electrons jump to higher energy bands, they leave behind what's known as "holes"—particles of positive charge that also pile up on the material's cold side, canceling out the electrons' effect and producing very little energy in the end. But the team wasn't quite ready to discount this material. In an unrelated bit of research, Skinner had noticed a curious effect in semiconductors that are exposed to a strong magnetic field. Under such conditions, the magnetic field can affect the motion of electrons, bending their trajectory. Skinner and Fu wondered: What kind of effect might a magnetic field have in topological semimetals? They consulted the literature and found that a team from Princeton University, in attempting to fully characterize a type of topological material known as lead tin selenide, had also measured its thermoelectric properties under a magnetic field in 2013. Among their many observations of the material, the researchers had reported seeing an increase in thermoelectric generation, under a very high magnetic field of 35 tesla (most MRI machines, for comparison, operate around 2 to 3 tesla). Skinner and Fu used properties of the material from the Princeton study to theoretically model the material's thermoelectric performance under a range of temperature and magnetic field conditions. "We eventually figured out that under a strong magnetic field, a funny thing happens, where you could make electrons and holes move in opposite directions," Skinner says. "Electrons go toward the cold side, and holes toward the hot side. They work together and, in principle, you could get a bigger and bigger voltage out of the same material just by making the magnetic field stronger." In their theoretical modeling, the group calculated lead tin selenide's ZT, or figure of merit, a quantity that tells you how close your material is to the theoretical limit for generating power from heat. The most efficient materials that have been reported so far have a ZT of about 2. 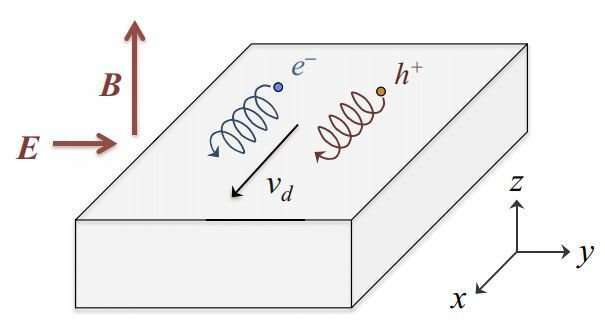 Skinner and Fu found that, under a strong magnetic field of about 30 tesla, lead tin selenide can have a ZT of about 10—five times more efficient than the best-performing thermoelectrics. "It's way off scale," Skinner says. "When we first stumbled on this idea, it seemed a little too dramatic. It took a few days to convince myself that it all adds up." They calculate that a material with a ZT equal to 10, if heated at room temperature to about 500 kelvins, or 440 degrees Fahrenheit, under a 30-tesla magnetic field, should be able to turn 18 percent of that heat to electricity, compared to materials with a ZT equal to 2, which would only be able to convert 8 percent of that heat to energy. The group acknowledges that, to achieve such high efficiencies, currently available topological semimetals would have to be heated under an extremely high magnetic field that could only be produced by a handful of facilities in the world. For these materials to be practical for use in power plants or automobiles, they should operate in the range of 1 to 2 tesla. Fu says this should be doable if a topological semimetal were extremely clean, meaning that there are very few impurities in the material that would get in the way of electrons' flow. "To make materials very clean is very challenging, but people have dedicated a lot of effort to high-quality growth of these materials," Fu says. He adds that lead tin selenide, the material they focused on in their study, is not the cleanest topological semimetal that scientists have synthesized. In other words, there may be other, cleaner materials that may generate the same amount of thermal power with a much smaller magnetic field. "We can see that this material is a good thermoelectric material, but there should be better ones," Fu says. "One approach is to take the best [topological semimetal] we have now, and apply a magnetic field of 3 tesla. It may not increase efficiency by a factor of 2, but maybe 20 or 50 percent, which is already a pretty big advance." The team has filed a patent for their new thermolelectric approach and is collaborating with Princeton researchers to experimentally test the theory. Just go to Lava of Volcano; It will be More Generous ! ""If everything works out to our wildest dreams, then suddenly, a lot of things"
-If everything works out to our wildest dreams then Rossi's E-Cat plants and Dr Mill's hydrino engines, which initially at any rate are supposed to produce energy as heat, might benefit from this tech. Even more so if they transition to PV and direct electricity generation. Maybe even pink lemonade by the ton which would make even more people happy. Hey - why isn't there the equivalent of the ton for units of liquid measure? they should operate in the range of 1 to 2 tesla. That's still an extremely powerful field. You can achieve it with neodymium permanent magnets over a short distance, just touching the magnet, but the problem becomes that these magnets can't handle high temperatures above 45 C and become permanently demagnetized above about 80 C.
Providing the magnetic field in an efficient fashion is going to be an interesting hurdle to cross. What Otto, ye never seen the 32k Fl Oz bottles in CostCo, also known as the 900L bottle? So 1000 liters equals - what - a Lon? (most MRI machines, for comparison, operate around 2 to 3 tesla). That info seems a little outdated. State-of-the-art machines today are in the region of 5 or even 7 Tesla. we just found this? gee, think, increasing wobbles! there is a spectrum?